My educational background is firmly rooted in Bangor University, having completed my BA, MA and recently submitting my PhD as part of the School of Philosophy and Religion. My research has primarily focused on the dialogue that exists between Eastern religions and Western philosophy, with particular focus on formidable parallels that exist between Buddhism and existentialism. 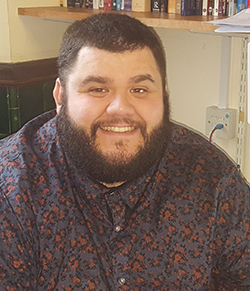 My research interests have influenced my teaching, leading me to develop a range of modules which examine the influence that Eastern religious philosophy and Western philosophy and culture have had on each other, exploring areas as diverse as human rights, politics, film, social media and ritual. My modules therefore focus on the practice of religion in modernity, recognising the vital role religion plays within contemporary society. 2017: ‘Postgraduate Teacher of the Year’, Bangor University Student-Led Teaching Award.